Farrar, Straus and Giroux, 9780374537203, 272pp. John Kaag is a dispirited young philosopher at sea in his marriage and his career when he stumbles upon West Wind, a ruin of an estate in the hinterlands of New Hampshire that belonged to the eminent Harvard philosopher William Ernest Hocking. Hocking was one of the last true giants of American philosophy and a direct intellectual descendent of William James, the father of American philosophy and psychology, with whom Kaag feels a deep kinship. It is James’s question “Is life worth living?” that guides this remarkable book. The books Kaag discovers in the Hocking library are crawling with insects and full of mold. But he resolves to restore them, as he immediately recognizes their importance. Not only does the library at West Wind contain handwritten notes from Whitman and inscriptions from Frost, but there are startlingly rare first editions of Hobbes, Descartes, and Kant. 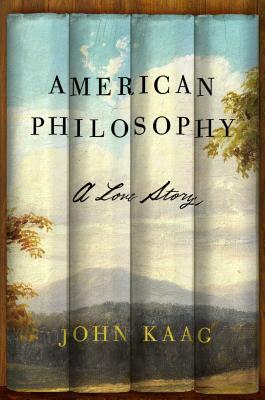 As Kaag begins to catalog and read through these priceless volumes, he embarks on a thrilling journey that leads him to the life-affirming tenets of American philosophy—self-reliance, pragmatism, and transcendence—and to a brilliant young Kantian who joins him in the restoration of the Hocking books. Part intellectual history, part memoir, American Philosophy is ultimately about love, freedom, and the role that wisdom can play in turning one’s life around. John Kaag is a professor of philosophy at the University of Massachusetts, Lowell. He is the author of American Philosophy: A Love Story, which was an NPR Best Book of 2016 and a New York Times Editors’ Choice. His writing has appeared in The New York Times, Harper’s Magazine, The Christian Science Monitor, and many other publications. He lives outside Boston with his wife and daughter.